With demand for seafood increasing and numerous fish species declining due to overfishing and other threats, scientists are proposing a seemingly drastic solution: close the high seas to fishing and turn it into “a fish bank for the world.” Don’t worry, they say, doing so won’t affect the fishing industry’s economic returns, and will ensure that profits from fisheries are more equitably distributed. An underwater view of a skipjack tuna purse seine fishery operation underway between the Philippine purse seiner ‘Vergene’ and the Philippine fish carrier/supply boat ‘Gene-2’ in the international waters of high seas pocket No1. 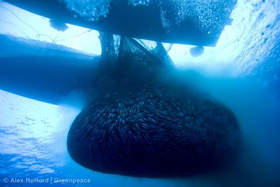 Purse seiners use fish aggregation devices, or FADs, to set net around, which are a highly destructive method of fishing that Greenpeace are seeking to be banned at the forthcoming Western and Central Pacific Fisheries Commission (WCPFC) meeting due to be held in Manila, Philippines from 2 to 6 December 2012. Marine areas within 200 nautical miles of countries’ coasts are designated the countries’ “Exclusive Economic Zones” (EEZs). Beyond the EEZs are the high seas, international waters that “belong” to the people of the world. After depleting fish stocks close to the coasts, many countries have taken to fishing in the high seas. This contributes to overexploitation of commercial fish species and threatens nontargeted species with habitat destruction, by-catch, and other problems. Currently, high-seas catches are worth about $16 billion annually — roughly 15 percent of the global catch’s annual worth of $109 billion. Read more on mongabay.com website.